Last night, we celebrated the Hunter's Moon. Prior to the ritual, we had a short inner court meeting where we did some housekeeping and planned meeting content for the next two months. Our ritual consisted of a bit of healing and connecting with our spirit guides. 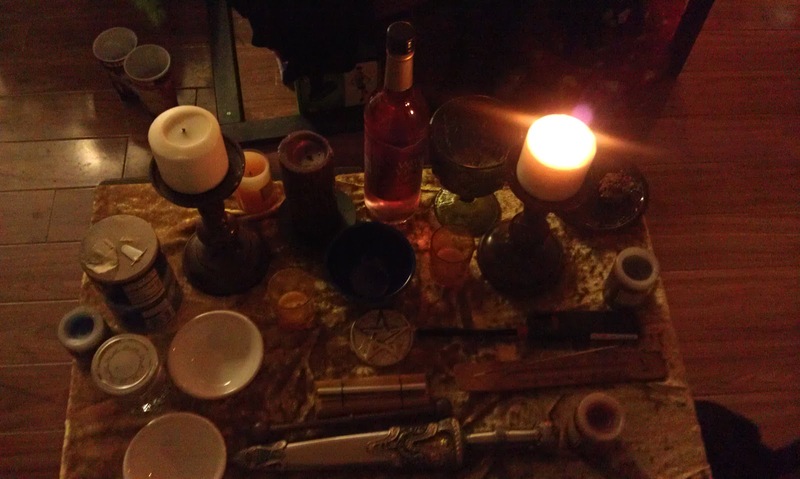 Due to the content of the ritual, we did our ritual inside, and it was interesting to adapt to the smaller space. But if there's something we're good at, it's adapting. And potlucks. Demeter (pronounced de-meh-ter, or dee-meh-ter, not dee-meeter) is most widely known as a Greek goddess of the harvest, and mother to Persephone. An agricultural goddess, it’s said that when Hades kidnapped Persephone, Demeter abandoned her role as bringer of the fruit, and instead searched high and low for her daughter. This abandonment was said to bring about the first winter and with Persephone’s descent each year, this is the impetus to turn the wheel. This is the myth that we usually see at or near most Pagan harvest festivals. But Demeter has a few lesser known aspects. Some of the earliest writing about Demeter describe her as a triune goddess, maiden, mother and crone. In her maiden form, she was known as Kore, a name later ascribed to her daughter, Persephone. She was known as an mother goddess of Abundance, and also as a Goddess of destruction as the Crone. 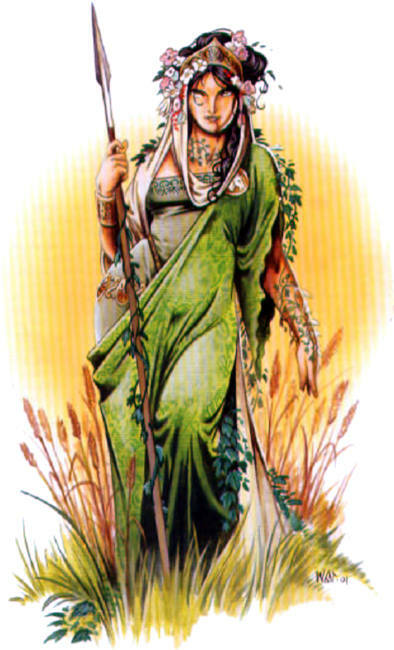 She is usually evoked as a mother goddess in modern Paganism, but as most know, mothers, while kind and nurturing, can also be forces to reckon with. In another archaic myth, Demeter was pursued by Poseidon while in her divine form of a mare-goddess. Hoping to disguise herself among the horses of King Onkios, she hid. But her divinity shone bright among the stallions, and she was raped by Poseidon, who had taken the form of a horse. She was furious at Poseidon, but her anger washed away once she bathed in the River Ladon. This led to two of her epithets- Demeter Erinys (Implacable Demeter) and Demeter Louisa (Bathing Demeter). She also seems to be related to several Minoan goddesses. One of these the poppy goddess, as the Minoan poppy goddess wears seed pods, and it’s thought that Demeter brought the poppy from her cult at Crete to Eleusis. Another correlation found to Minoan goddesses was found in Arcadia- she was worshipped as a Great Goddess: a woman with a horse’s head with hair of snakes. One hand held a dove, the other a dolphin. Demeter teaches us several lessons, the first being the lesson of motherhood. Now, not all of us will be mothers, but we all can learn the lesson of the mother- caring for something important to us. Some of us are mothers to fur-babies, some of us mother our friends, or nieces and nephews. We nurture and care for our babies, and Demeter teaches us that when someone wrongs our kids, or someone hurts our children, that it’s time to act. No matter how hard we try to protect our children, situations will occur where we find ourselves in the position to protect our loved ones, and the mother will defend their child – sometimes to the death. Whether it’s a broken arm from a skateboard incident, or a physical attack- the mother’s instinct is to protect the child at all cost. This protective anger is a Demeters gift, and ingrained within our spirit. Another lesson that Demeter teaches us is the down-side of single-minded focus. When Persephone was abducted by Hades, the Lord of the Underworld, Demeter abandoned her place as she who made the plants grow, and instead set off looking for her daughter. She was upset, saddened and focused on her daughter, and because all of her energy was focused on this, all of the crops died, giving us the winter that we must prepare for each year. In addition to the lessons that Demeter shares, we focus on the lessons of the harvest during this transition from summer to fall: being grateful for the harvest, storing food and preparing for the winter. The cycle of the year ends, and we prepare for the beginning of the next cycle. It’s time to review the choices we made this past year, and deciding whether the outcome is one of your liking. The new year is fast approaching and it’s time to decide what to leave behind, and what we look forward to. We leave past grievances behind, and look forward to the light of the Sun on our path at Yule.